Ss Anthony & Clare started life in 1868 as a thatched roof Church. It grew out of Pontypool with the building of the canals and the Catholic workers. Pontypool was served by Franciscan Monks hence the title of S. Anthony of Padua and S. Clare of Assisi, two great Franciscan Saints. There have been a few alterations to the Church and the site over the years. One of the changes is thought to have been in the early 1900s when the thatched roof was changed to slate and a small bell housing added. This was changed later in the 1900s when the bell vanished and other changes were made. The windows in the east end were bricked up and the transept was bricked up at either side of the sanctuary to create two rooms, one to act as a sacristy, the other as a small meeting room. Also, the Hall and the House were added to the site. There used to be a duck pond where the Hall now stands! The Hall is used for a number of events and meetings both for the Parish and the community one of which is the regular Bingo session! In the mid 1900s a Grotto was built in the grounds. It is of Our Lady of Fatima and the three children. These were all marble statues and the Grotto is an excellent addition to the Church grounds. However, in the mid 1900s the statues of the three children were stolen! Insurance meant that they could be replaced, but only with fibreglass statues. Very nice, but not the original marble. There were some changes to the Hall in the year 2000. The back was sectioned off so that the sacristy and small meeting room could be added. 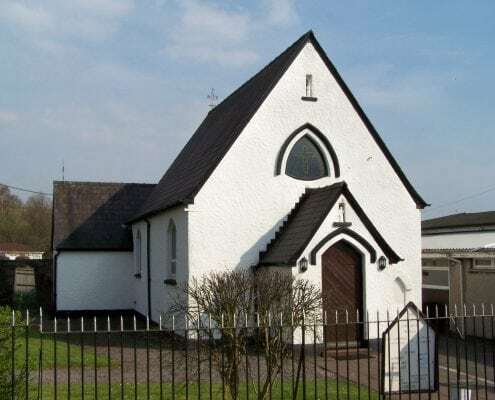 This was because there was some major decoration and refurbishment to the Church, and the walls which formed the two rooms were taken away to give more seating space. The windows were also unblocked and some new stained glass windows were added. The two above the altar are the hands of God and the Holy Spirit in the form of a dove. These are either side of the crucifix and together they make up the three persons of the Holy Trinity. To the right of the altar stands the Tabernacle; this is the Tabernacle that used to stand in S. Winefride’s Church in Cwmcarn. The window, on this side of the altar, is another new stained glass window with a Eucharistic theme and helps create a Blessed Sacrament Chapel. Together with the above works the windows were changed to uPVC, the lighting system was upgraded, and the Church was painted inside and out! All this work was possible because the house that was the Presbytery was sold. Ss. Anthony & Clare is a lively and active Church with a lot of young families and children to keep us up-to-date and on our toes! A lovely sight is to see all the children come in so enthusiastically on a Sunday morning after the Children’s Liturgy. 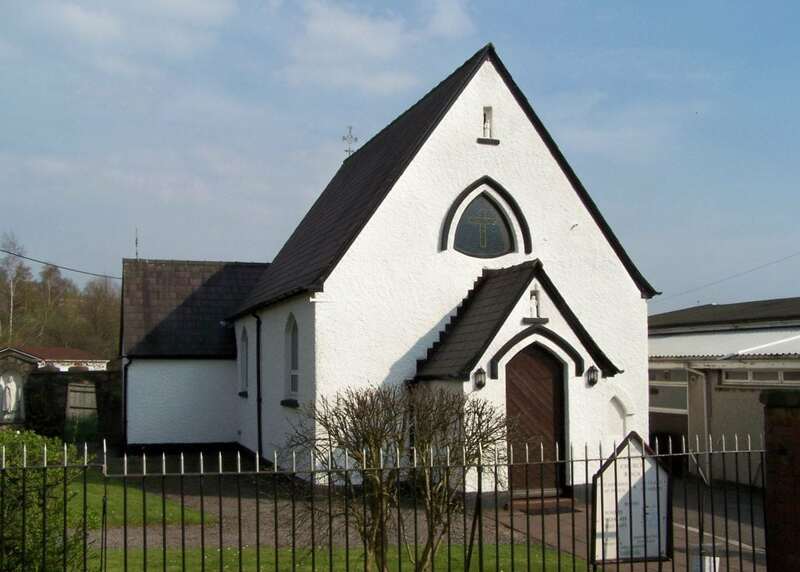 The Church is now in a group of three, and linked with the Sacred Heart, in Pontllanfraith, and Our Lady of Peace, in Newbridge.